Interestingly, those who thought they received surgery but didn’t, improved as much as those who did. You hear about so many people today having knee surgery after suffering through years of chronic pain due to sports injuries or osteoarthritis. They may have tried pain medication (over-the-counter and prescription strength), massage therapy, bed rest, heat and ice application, even cortisone injections – but the pain continues. It often worsens to the point where the doctor indicates that a surgical solution is the only answer. But is it? A study was conducted involving 180 patients, divided into three groups, who were told they required arthroscopic surgery on a knee to relieve pain and stiffness due to osteoarthritis. Arthroscopic surgery involves an incision into the knee to remove worn cartilage. 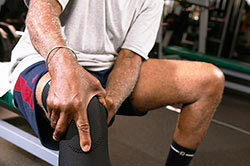 The first group had surgery called arthroscopic debridement, which removes worn or loose cartilage. The second group had arthroscopic lavage, which flushes painful debris and inflammatory enzymes out from the knee. The third group was all prepped and an incision into the knee was made, but no cartilage was removed. All three groups were followed and assessed at regular intervals over the next two years and at the end of that time, all groups reported “equal degrees of reduction in pain and increase in activity level.” Interesting, isn’t it? Yet, more than 650,000 of these same procedures are performed each year and, sometimes, healthy cartilage is removed with the worn cartilage, causing even further damage to the patient. Yes there is – and while surgery may be an option, it should always be the last resort. Chiropractic care offers a non-invasive alternative to drugs and surgery for the type of knee pain cause by osteoarthritis. We recognize that knee pain can be related to pelvic imbalances and spinal problems higher up the spine. Correcting these misalignments often resolve knee pain and ankle problems without the risk of surgery. Please keep in mind that our practice is committed to helping you live a way of life that focuses on healing and preventing health problems. We don’t believe in masking symptoms with medication or advising that you engage in needless surgery when your body may be fully capable of healing itself.